How is your dog coping? The summer months can be brutal to your dog. Dogs are much more susceptible to heatstroke than humans. One reason for this is your dog wears his fur coat all year round. And while dogs do have sweat glands on their feet, they do not have them on the rest of their body. They rely on panting, a method of breathing out excess heat, to cool down their bodies. This method is not as effective as sweating. Some breeds are much more susceptible to the heat than others. 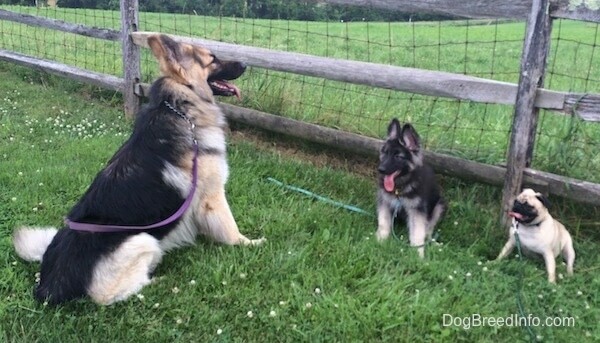 Dogs with thick double-coats have a harder time beating the heat. 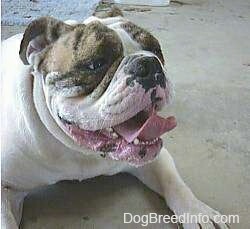 Dogs with pushed-in faces, such as Bulldogs, Pugs and Boxers, have smaller airways, and therefore have less of an ability to blow out hot air. 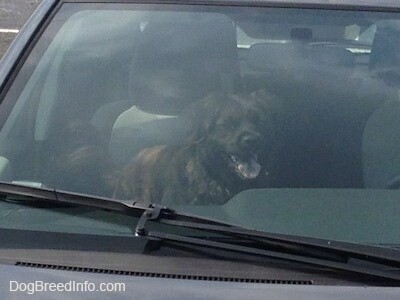 The major cause of heatstroke in dogs is leaving a dog in a parked car. Even with the windows cracked on a 70°F (22° C) to 80°F (26°C) day, while it may feel comfortable outside, the inside of your car can heat up to over 100°F (38°C) in minutes! As you can imagine, with that fur coat on, your dog's body temperature rises very quickly. 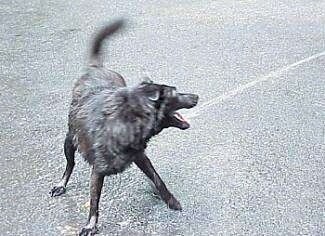 This dog was left in a dark colored van with only the front windows cracked. The van was parked in the sun and it was 81 degrees outside in the summer. 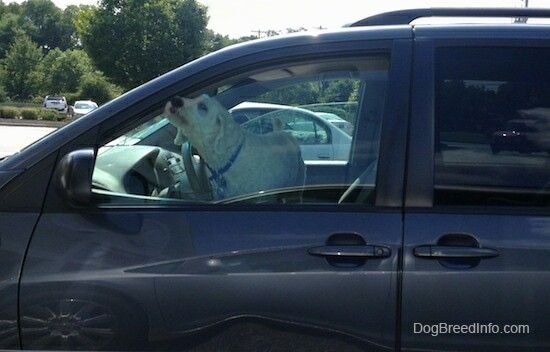 Dog left in a van, which was parked in the sun on a summer day. Exercising in hot weather is another common way heatstroke can occur. As with humans, older dogs, overweight dogs and/or dogs with heart or lung ailments are much more likely to suffer from heatstroke than younger dogs that are more in shape. Do not push your dog to exercise on very hot or humid days. In some extreme cases seizures, diarrhea and vomiting can occur. Cooling your dog's body temperature down quickly is very important. The fastest way to do this is by using cool water. Do not use ice water, as a dramatic change in temperature can be dangerous. You can put your dog in a bathtub, sink or kiddie pool filled with cool water. 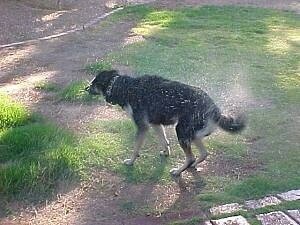 A very good way to cool down a dog is to put water on its chest. 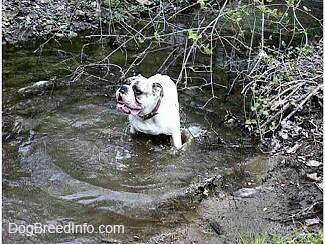 Also a lot of heat exits the dog's body through his feet, so having the dog stand in cool water will also help. Another way is to put cool wet towels around your dog's body while he is standing in something cool. It is important to cool off the chest and feet. Be sure to refresh the towels in cool water every few minutes, as the towels will quickly reach the same temperature as your dog's body. Spraying your dog with the hose, dumping buckets of water on your dog, or placing your dog directly in front of an air conditioner are a few more ways you can cool down your dog's body temperature. Offer your dog a drink and be sure to contact your vet right away. 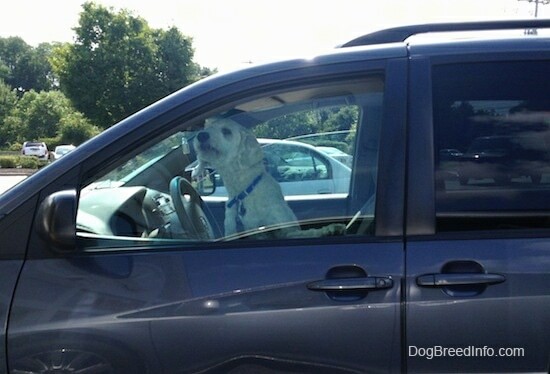 Do not leave your dog in a parked car on hot days. Even on 70°F (22°C) or 80°F (26°C) days, if your car is parked in the sun, even with the windows cracked, temperatures can reach over 100° F (38°C) in just a few minutes. Parking in the shade will help a little, but on hot days, even parking in the shade is not enough. It is best to leave your dog home. Provide plenty of fresh cool drinking water. Dogs should be provided with water at all times. Keep your dog's water clean and fresh. Do not leave your dog's water bowl in the sun, or it will heat up. Imagine drinking a cup of hot tea in the summer sun! 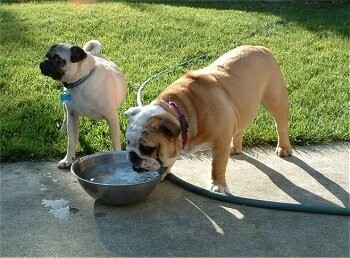 Lilli the English Bulldog and her Pug friend Smash getting a drink after playing. Always provide a shady spot for your dog. Dogs should always have a shady spot to get out of the beating heat of the sun. Be sure there is a shady place for your dog to go. Remember, as the sun shifts, so does the shade. Trees may not provide the proper shade all day long. 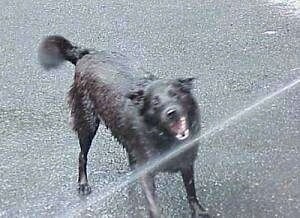 This is Lexi, a 3-year-old Black Lab/German Shepherd mix, enjoying the hose. 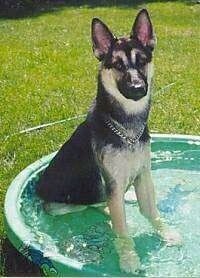 Shanieka, a German Shepherd/Siberian Husky mix, keeping cool in her very own splash pool!